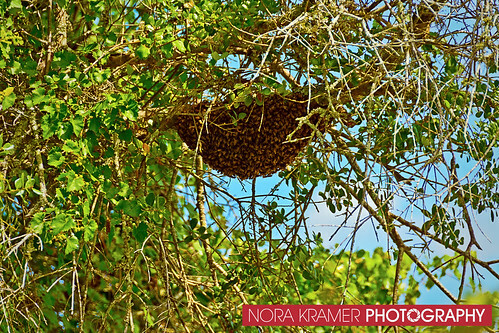 Nora Kramer Photography: I Will Have Some Bees, Please! I Will Have Some Bees, Please! I was able to witness a unique event a few days ago. It's something that I had never seen before, at least not quite so up close and personal. The house next door to me apparently had a "bee" issue that needed to be taken care of. 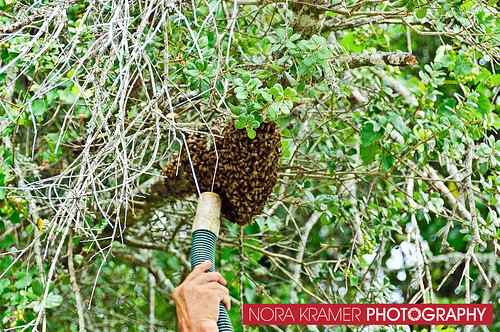 Honey bees had taken up residence within the brick walls of the neighbor's vacation home. It is generally only used when the owner's come down for vacation, so sits empty a good deal of the time. During their last trip down, a few months back, they noticed sounds coming from within the walls and realized they had a bee issue. They attempted to take care of it themselves, at that time, but were unsuccessful. They then hired a bee exterminator to take care of it for them, who was also unsuccessful. 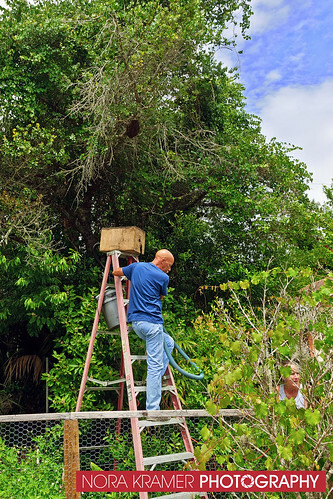 Professional bee keepers were then hired to get the job done. They came out, removed part of the brick wall, to take out the honeycombs and flush the colony out. They weren't there to kill them, but rather to "relocate" them. I certainly didn't want them relocated to my back yard! 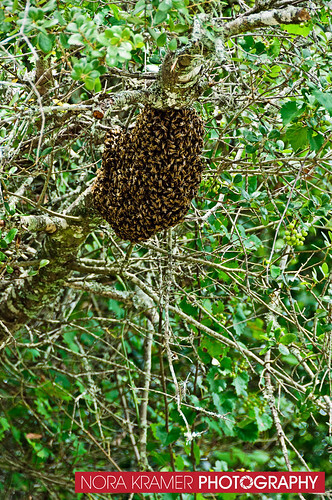 While that was, of course, never the intention, as the bees left the inside of the house, they decided to swarm into our back yard and gather up on one of our trees. 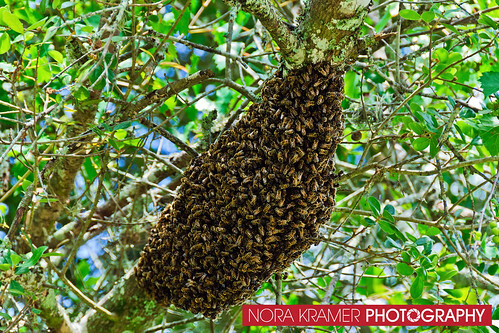 It was quite a site to see a "bee tornado" form and then see them land on the largest tree in our back yard. I was both fascinated, and yet a bit concerned, since we had a large Memorial Day BBQ planned for that day, with lots of family arriving within the hour. I knew kids would be playing with my dog in the back yard, and I began to have visions of swarms of bees attacking my guest. I watch too many horror movies, I guess. 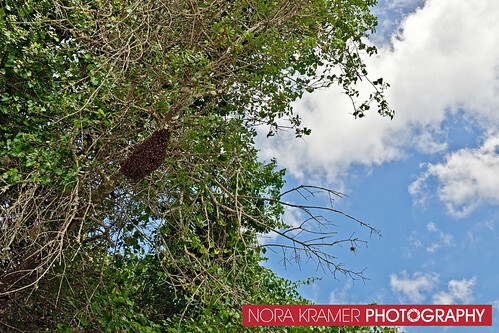 But, the bee keepers were right on top of it. They swooped in with a rather nifty "vacuum cleaner" type gadget and sucked those babies right up! I like that they weren't trying to kill them, but rather relocate them to their property, where they keep bees. But, I was also glad to see them removed right before guests began showing up! The bee keepers have a really great You Tube channel, where they post videos of some of the removals they have done. They filmed the removal from my neighbor's house, and you can watch them getting the bees out of our back yard in it. 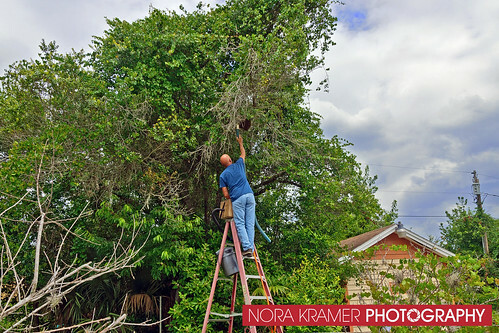 If you are interested in seeing how they handle a removal like this, watch their really neat video of the removal. When I watched the video, I was surprised to hear my own voice, talking to one of them (at 3:48), about their fascinating work. You can also hear my baby girl, Harley Quinn, barking (at 10:35). She was totally freaked out by the people in "HER" yard.